All occur in hygienic darkroom retreat: extended rest in total darkness. Healing super-intensifies. Energy and function are restored. Clarity, strength, and joy reappear. The lost self returns. This complete manual explains why a retreat works, how to do it, and how to make a darkroom at home. Miracles are easy. Just provide their conditions. Indigenous and spiritual traditions have used physical darkness for millennia. This is the first approach to darkness—and psychology—based on hygiene. Not just cleanliness, hygiene is the science of health. Hygiene recognizes the self-preserving nature of life and all its normal conditions: fresh air, ample sleep, pure food, frequent bathing and exercise, etc. Darkness enables the full application of its principles to the organic system of the psyche. Hygiene began to show nature’s way to industrial civilization in 1832. Worldwide massive improvements in public health followed. Benefits continue for billions who never see doctors or even understand the terminology. Hygiene is history’s most influential approach to health. 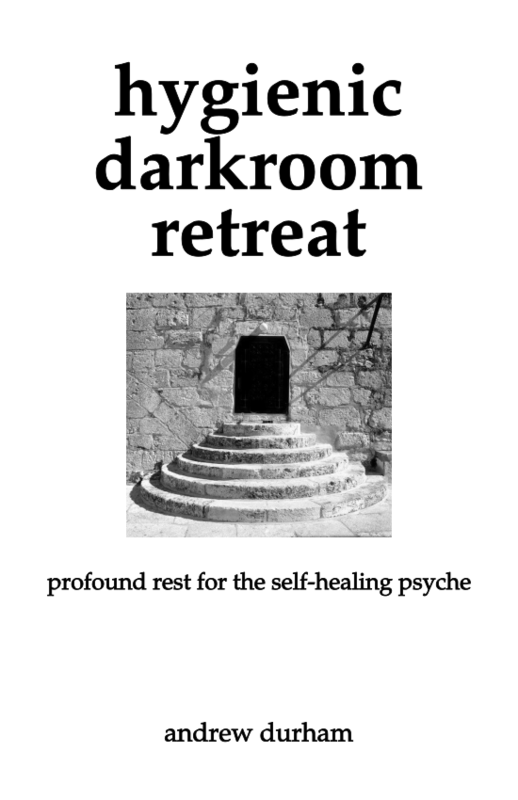 A hygienic darkroom retreat provides all conditions of profound rest, which healing requires. These are normal conditions, perfected and temporarily extended, as in fasting. The psyche heals itself autonomically of even the worst that life deals us. The result: reliable miracles. See introduction > help for many ways to participate in and support hygienic darkroom retreating. I wish to make another attempt at a 20-day retreat in order to heal from my psychosis and accompanying exhaustion-depression. I have difficulty organizing this. If you would like to help me please write me. Donations: I appreciate them very much. I live simply, so even small amounts help. Snailmail, bank transfer, or deposit: email me about how to use these methods. Include your location.